Philmodel: ....But it's 25 years old! I've finally got over myself and started to build that 'Hind' gunship, the one I was banging on about on here a while ago. Here it is, this time with paint on. So what was the hold up? 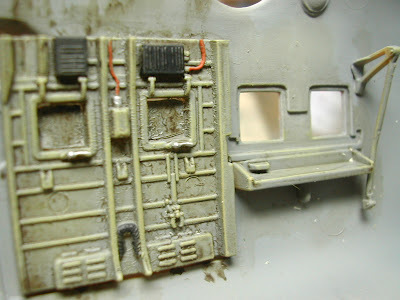 I acquired the Monogram MiL Mi 24 gunship kit in 2004, and it came with the Eduard interior and exterior photo-etch set. As you doubtless know, these sets are very extensive. Superb quality too, but they can add at least a month to the building time. 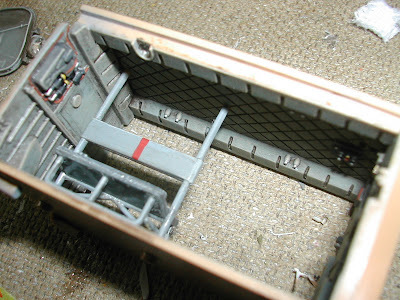 And the parts are a bit thick, although there's no denying the level of detail. All this sets me off on an internal monologue: It's 25 years old, look at all those metal parts.....but it's a lovely kit....it'll take ages to add all that metal though....And back it goes on the shelf to silence the inner argument. This time, however, it has come out for keeps. I just want to build the thing and keep it simple. I was prepared to abandon all those complex metal parts and just get on with it. Did I do the right thing? 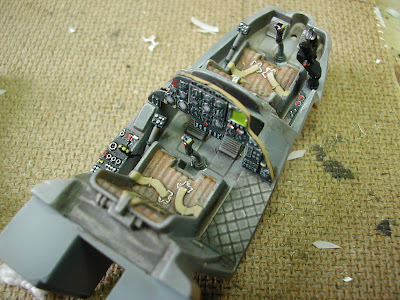 Here is the complete cockpit and rear cabin. Not a metal part in sight. It's not Eduard but it's no slouch, is it?